In 1602, as Queen Elizabeth I's reign was drawing to an end, English Catholics looked forward to better times. For decades, the authorities had regarded Catholics as potential enemies of the state. High-born Catholics could not get advancement at court; Catholics unprotected by rank or wealth were often harassed and even attacked. They were obliged to attend Church of England services and those who refused, known as recusants, were heavily fined. Catholic hopes were pinned on Elizabeth's successor, James VI of Scotland. Although he was Protestant, he was the son of Catholic heroine and martyr, Mary Queen of Scots. In 1602, Thomas Percy, a young nobleman from the influential Catholic family which held the earldom of Northumberland, rode secretly to Edinburgh and received what he thought was James's assurance that he would allow Catholics the freedom of worship. However, James was well aware of anti-Catholic sentiment in England, and when he succeeded to the throne as James I in 1603, he did not repeal the laws against recusants. The following year, under pressure from Parliament, he expelled Catholic priests from the country. Catholics felt betrayed, and on 20 May 1604, five men met to plot James's overthrow. 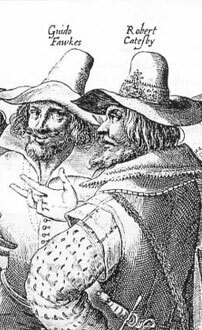 Four of the plotters were young men from well-connected recusant families: Thomas Percy, Jack Wright, John Winter, and their leader, the charismatic Robert Catesby. The fifth, older man was a Yorkshire-born mercenary soldier who had just returned from fighting for the Catholic cause in the Netherlands. He called himself Guido Fawkes. Catesby had recruited him for his expertise with gunpowder. Their plan, devised by Catesby, was staggeringly ambitious: to blow up the Houses of Parliament during its next opening ceremony. The explosion would kill not only the king but the country's lords, bishops, and judges. And crucially, the heir to the throne would also die, plunging the country into a succession crisis. In the upheaval, Catesby hoped that Catholicism would re-establish itself. 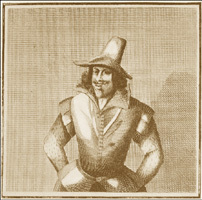 Thomas Percy installed Guido Fawkes in his lodgings in Westminster. Throughout the summer and autumn of 1604, they laid in supplies of gunpowder and planned the attack. After a number of delays, parliament's opening was finally set for 5 November 1605, which gave Catesby time to plan a widespread Catholic uprising. He proposed to raise a troop of cavalry from the stables of rich Catholic families. What if the plot had succeeded? After the explosion, he would lead it to Coventry and kidnap James's elder daughter, Elizabeth. The Catholic population would rise up in support of them and they would then install Elizabeth as queen and rule England through her as a Catholic country. 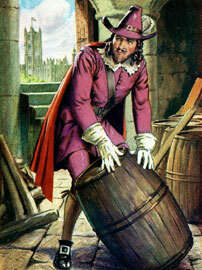 During the summer of 1605, Percy leased a cellar beneath Parliament House. Gunpowder, firewood, and fuses were smuggled in, while Catesby began recruiting potential cavalry leaders. In October, he approached Francis Tresham, who he hoped would rally the Midlands. But this proved to be a misjudgement. Tresham had many friends in the House of Lords; horrified by the violence of the plot, he tried to persuade Catesby to abandon it. On 26 October, Lord Monteagle, a closet Catholic married to Catesby's first cousin, Elizabeth Tresham, was handed a letter that had been delivered by a mysterious stranger. The anonymous letter urged Monteagle to 'retire yourself into the country for... they shall receive a terrible blow this parliament and yet they shall not see who hurts them'. By his own account, Monteagle immediately took the letter to James I's secretary of state, Robert Cecil. When the conspirators heard about the Monteagle letter, Catesby accused Tresham of betraying them; he vigorously denied it. As no names had been mentioned, and no action was taken against them, the conspirators decided it was safe to go ahead with the plan. Sir Thomas Percy, Jack (nicknamed John) Wright, Thomas Winter (or Wintour), and their leader, the charismatic Robert Catesby, all young men from well-connected recusant families. The fifth, older man was a Yorkshire-born mercenary soldier who had just returned from fighting for the Catholic cause in the Netherlands. He called himself Guido Fawkes (aka John Johnson). Catesby had recruited him for his expertise with gunpowder. The others were Thomas Bates, Robert Winter (or Wintour), Christopher Wright, Sir Everard Digby, Robert Keyes, Ambrose Rookwood, Frances Tresham, and John Grant. Robert Cecil was just biding his time. After showing the letter to James, who had been away on a hunting trip, the decision was taken to search the Houses of Parliament. On Monday, 4 November, as Catesby was riding to the Midlands to raise his cavalry, the king's men searched the cellar. Fawkes was arrested and a warrant issued for Percy's arrest. Hearing the news, the other plotters fled after Catesby. Catesby now led them into a brave, if forlorn, last stand. On 5 November, as news of the foiled plot spread across London and people lit celebratory bonfires, the conspirators rode round Catholic estates urging an uprising. But Catholics had heard rumours of the king's death and were afraid; none of them joined Catesby's cause. The next morning, the sheriff of Worcestershire and a posse of two hundred armed men surrounded the conspirators: Catesby and three others were killed; the rest were taken to the Tower of London. Subsequently, others who had been drawn into the plan were arrested, including Francis Tresham, who died in prison. Guido Fawkes, tortured on the rack, gave names and details of the plot. He and the other surviving conspirators were tried in Westminster Hall and publicly hanged, drawn and quartered. The Gunpowder Plot had been decisively defeated. Cecil lost no time in turning the affair to James's advantage, claiming it as God's deliverance and proof that he was on the side of Protestant England. As Catholics had feared, new restrictions were placed on them, and in the immediate aftermath of the failed plot, it became even more dangerous to practise their religion.